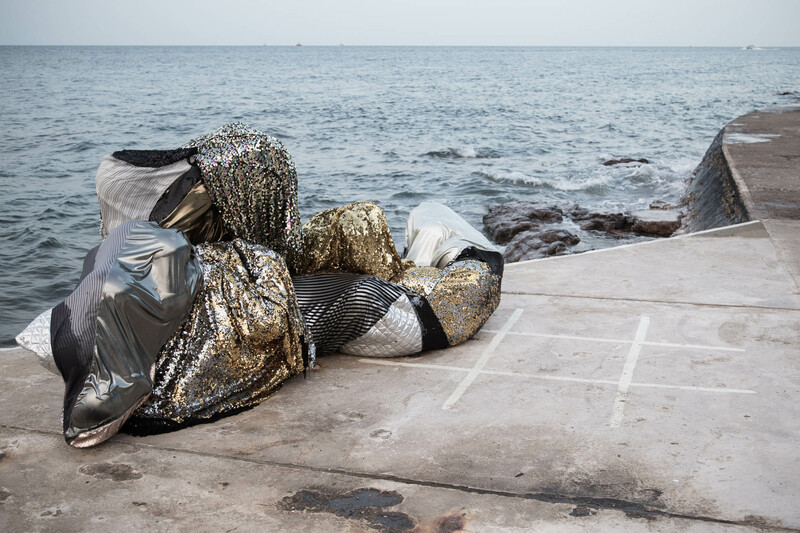 Slow criticism: Diana Damian and Anette Therese Pettersen consider a meditative seaside performance created by Norwegian artist Ingri Fiksdal. This piece, about a rather short dance performance – Ingri Fiksdal’s Diorama- was a long time in the making which is to say, it involves a long journey, and an even longer period of collaborative writing, thinking, discussion and development. Life, vacations and illness/fatigue interfered, or perhaps, shaped it. This text was finished two months after Fiksdal and her team left Brixham. Pre-journey: One of us is travelling from her apartment in Oslo; it is 11:00am on a Saturday. The journey begins by train to the airport, continues on a flight to London Heathrow, a tube journey to North London, and a long walk home. It’s now 5:22pm, we both meet by the tube station, and spend the night together before an early wake-up to take a first, planned train at 10:00am from Paddington station. What follows is a series of over six train journeys, a bus trip, an unplanned boat trip, and a long coastal walk, before a return on a night train, a complicated booking on a single non-sleeper carriage of regular, expert commuters, an early taxi and a long period of thinking time. Arriving into Paddington station in London, the first thing we noticed was the diffracted light, moving between the metal of the arches and the tops of trains slowly making their way in and out. We began with this arrival, and with a delay – a kind of disruption that was to echo throughout the day, but which marked a passage: one of landscape, a change – in territory, communities, mobility- and a different sense of direction. We began our journey to encounter Fiksdal’s piece with a slight displacement, and as we moved from train to train, from bus to bus, in a journey that was to unfold almost the entire duration of the day; we crossed busy city centres and quiet country roads, arriving at the ocean, late on a frosty afternoon, marked by a soft drizzle, a coastal, Sunday silence. Our final trip was to take place on a boat, and as we waited for the tide, the light began to change- our legs were still, but the forward motion still grappled our bodies. What a way to arrive, nine hours later, by the Shoalstone Pool in Brixham, a small fishing town in Torbay, Devon. As we sat on deck chairs, facing the horizon, by one of the last remaining seawater pools in the country, sunset splashing vivid colours, we watched bulbous objects turn to bodies- we were somehow, but in and out of tune with this slow passing of time, this marking of ecologies. Against the pool, small congregations gather and slowly shift: configurations of bodies, wrapped in slick fabric, reflecting the many shades of blue, grey and pink of the dusk. As they unravel and separate, something about the space changes too, shifting the tone whilst a low, drone-like sound drenches the space. By the edges of the ocean, in the colours of seawater, the bodily and the scenographic collide in a meditation on togetherness and movement. Diorama for Shoalstone Pool explores Torbay both as a timeless place, and one marked by change: the shifting tourism, changing industries, new generations and wider political changes- Fiksdal’s work makes space for those to appear, gently, observed only by the viewer keen to see them. It was curated by Situations as part of a larger Torbay project, The Tale, which brought together by the work of writer Philip Hoare, featured an arts trail across various landscape and spaces, weaving encounters into the different layers and histories of this part of South Devon. In this way, Diorama for Shoalstone Pool was accompanied by this orchestra of site specific works. Ingri Fiksdal is currently a research fellow at the Oslo National Academy of Arts, where her work deals with perception and affect. For the last five – six years, this has been very examined across her practice by integrating the audience in her performances. In Night Tripper (2012, In Between Time Festival), the audience walk into a forest at sunset. They sit around what looks like a camp-fire, but instead, reveals itself to be two dancers moving slowly – back to back. The woods feel like an adopted scenography, blurring what makes its way into the performance, and what remains peripheral. This blurring is quite typical of Fiksdal’s works. It is a way of sharpening the senses, making the viewer look and feel more intensely. She usually works with several performers, and the choreography often includes the surrounding space and elements such as sound and light. There are recurring choreographic motifs such as bouncing, the slow banging of the head, body contortions. This sense of movement both internal and external is not unfamiliar; as writers, we’ve spoken often about the kinds of audience member we become. Usually, the critical writer is seen as an informed, prepared audience member, but there are also moments when preparation turns into something else: spending an entire day on trains, crossing an ocean, walking uphill, fast-paced, ground running beneath your feet, after trains and boats and buses, to see a performance that is less than an hour long. In this instance, the critic and the performance need time to meet. It is a meeting point that very much feels part of Fiksdal’s work, too. We had both arrived at Fiksdal’s performance so hastily, so late, that our bodies were still travelling, in contrast with the audience that had been waiting patiently, sat on deckchairs or looking across the coast. One of us was settled by the slow, meditative pace of the work, lost in the metals that adorned these bodies, resting on the edge of the pool, being one with amorphous shapes. The other still had a fast pace, as if the body (though quite tired) still was ready to run, ready to keep moving, and needed more time for the senses to be adjusted. A bit like getting out of a battle mode and into a more meditative one. This seems apt for a performance that reflects as much on the passing of time, on the change in landscape, and scenography as an ecological practice of bodies both human and non-human. Diorama was not the only common point of encountering Fiksdal’s work; during the summer, in the leafy park Ravnedalen, overlooked by cliffs, in the midst of Kristiansand, also encountering the ocean, we experienced Shadows of Tomorrow. 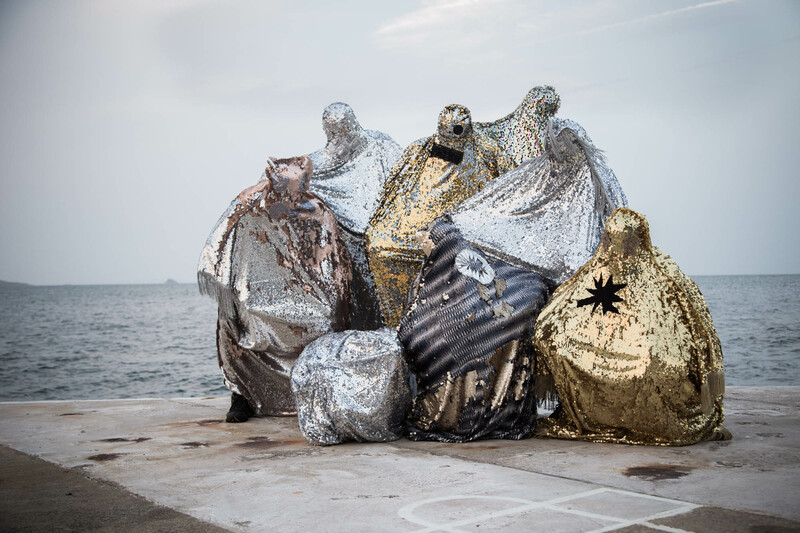 The work features a group of dancers clad in layers of clothing- shawls, scarves, long patterned skirts and cloth wrapped around their heads and faces- moving slowly, together, sometimes in unison, and sometimes apart. Like a group of travellers, nomads, clubbers, marked by their anonymity, the energy of the group dissipated slowly in the landscape of the park, dissipating and gathering, as the dancers made isolate gestures- raising their hands, shaking their bodies. The day before, another version of the same performance had been shown at the old theatre in Kristiansand. The movement patterns were more or less the same, but the surroundings so different. Sitting indoors, at times just inches away from the performers, the energy was intense, the smell of sweat and sound of people breathing heavily also contributing to this. Watching them from a distance in the park the day after, with the smell of grass instead of sweat, and sound of birds instead of breathing, connected the performers to the environment in a different way from the day before. This same sensation, of landscapes and bodies colliding, is also present in Fiksdal’s earlier work, Night Tripper, which we each experienced in entirely different surroundings. One encounter, in the midst of a rich, tall forest at In Between Time Festival’s Up to Nature, all muddy feet and drizzly rain, was striking in the ways in which it brought the audience, travelling through the forest, to a small clearing, surrounded by trees and (fake) fog. Balancing the landscape as scenography, with the power of the ecological to wash over the performance is a tension in Fiksdal’s work. Another encounter with that same work occurred a year later, in the forests outside of Oslo, by means of a local bus journey with the rest of the audience and a walk down a path, guided by a host of the performance. We recall arriving at the spot, the trees surrounding the ‘stage’ , which had been made into a temporary bar, with drinks and snacks. People were hanging out, talking and drinking – until told to take their seats. In this way, going into the forest becomes very similar to going to the theatre. It might also be one of the effects Fiksdal’s blurring strategy, which affects how we look at scenery and the environment, taking in the scenography in a way where every element is to be closely examined. In Diorama, on the edges of the sea, where landscape is both scenography and context, where the pool itself comes with a spatial history, we asked, what is deliberately framed and what is accidental? What is an actual part of the scenery, pre-Fiksdal, and what is arranged, like the chairs spread out at the end of the pool? This sense of the incidental and the choreographed plays out in other elements; fragments of the pool’s seawater are red – is this algae, or coloring? Likewise, the soundscape becomes an interplay between recorded and surrounding sound. It shifts from a drone-like echo, subtly weaving its way into these bodies that stretch minute movements over long periods of time, to a punctured, industrial noise, to indecipherable whispering voices that crowd the orange horizon, drifting into the sea. This quality of the soundscape also leaves space for the sounds of the performers: the sound of sequins being dragged along the concrete floor, that of balloons swaying in the wind, but also that of the audience – the scratching of a beard, or two dogs that suddenly have their senses sharpened. It’s a noisy silence that picks up in volume, over time. Perhaps this could be called a strategy of heightening the senses, of applying the frames of theatre to the place, more than the site specific. Across Fiksdal’s work, there is a sense of moving theatre’s spatiality into the landscape. In Night Tripper, the effect is a moving of the black box into the woods, whereas in Diorama, the scenery becomes the theatre. And whereas in Night Tripper, the conventions of theatre are reproduced, with an audience gathered around a performance, Diorama felt freer, the audience lining the edges of the pool. And of course, this stretching marks other relationships too, a kind of cross-species audience of coastal birds, of dogs and cats; perhaps Diorama is choreography for the era of climate change, for the era of politicised, ecological thinking, in which theatre moves organically, in which one landscape melts into the other. As we recall our own journeys, both collective and individual, these two become as much the work as the piece itself, stretching across the sea, on rail lines and tube lines, on planes and long walks. ‘Diorama for Shoalstone Pool’ was performed as part of ‘The Tale‘, Shoalstone Pool, Brixham, 8 -24 September 2017. For more information on the project, visit Ingri Fiksdal’s website.